Why choose Scuba-Do? No Crowds! 10 Divers Max! Resort Style Service! Fast Access To Dive Sites! What do we offer? Wreck Diving Reef Diving Instruction Snorkeling Private Charters The Florida Keys host the third largest barrier reef on the planet, and the only living coral reefs in North America! John Pennekamp Coral Reef State Park and the Florida Keys National Marine Sanctuary have insured protection for our abundant fish life unequaled anywhere. Scuba-Do has been in operation for nearly 18 years and is proud to say we continue to have a return customer rate of about 90%! Our first concern is your SAFETY, and the second is HAVING FUN! At Scuba-Do, our goal is to have you, your family and your dive buddies feel safe, comfortable and at home on our boat! Our first concern is your safety and the second is HAVING FUN! Scuba-Do is a custom dive boat. It was rebuilt a few years back - by divers, for divers! She is not just a boat you dive fromâ€¦.she is a great dive boat, innovatively laid out with the best diver comfort and convenience in mind! We still offer LOTS of great amenities as always! Scuba-Do Features Custom trips Marine toilet Large bench for seating while sunning Fresh water shower Large cooler More undercover seating to stay out of sun, wind or rain Large camera table w/ separate rinse bucket Dry storage space Scuba-Do is painted on the bottom of the boat! And last but not leastâ€¦.The BEST Entry-Exit access system for diving We bring your gear to you while you are seated on the dive transom! Known for its underwater caves and swim-throughs, the high profile coral ridging makes this reef a spectacular dive! Dive sites most visited are Five Caves, Hour Glass Cave, Christmas Tree Cave, Sand Bottom Cave, 40-Foot Cave, Grouper Hole, Woody's Ledge, and Turtle Ledges. Depths range from 20-55 feet. Pillar CoralsAnother small, very unique site we dive to depths of 15-25 feet. It has been said that we have one of the largest patches of pillar corals in the Caribbean. Pillar Corals are an uncommon stony coral with millions of polyps that open and feed during the day! They are a unique type of digitate coral that grows in an upward cylindrical shape like fingers. The Benwood WreckA great shallow wreck for all level divers with depths of 25-45 feet. This was a British-Built steel hull freighter built in 1910 and is 360' long with a 51' beam. There is not much left of her now as it has been used for bombing practice by the military over the years because it was a navigational hazard. The bow is still intact, but most of the wreck is now just scattered metal deck platting with the ship's ribs still visible. This is one of the fishiest dive sites we go to and is also covered with beautiful soft corals. Great for photography! Key Largo Dry RocksThe location of the world famous Christ of the Abyss Statue which stands nine feet tall. This reef is a very shallow dome-shaped reef which breaks the surface at low tide on the landward side, and slopes to 25 feet on the seaward side. The statue is one of three cast from a mold by an Italian sculptor Guido Galletti. It was originally made for Egidi Cressi, the dive equipment manufacturer and later donated to John Pennekamp Coral Reef State Park in 1966. Snapper LedgeA very special reef and one of our favorites with a depth of 20-25 feet. It's a real small ledge that holds some pretty amazing things! Just off the ledge is what we call the fish bowlâ€¦a small circular shaped ledge that contains a wall of fish, mostly Grunts, Goatfish, and of course Snapper. This school of fish is so tight and thick you can not see through them at times! You can usually count on seeing a few nurse sharks in the fish bowl, along with green, spotted, and golden tail Moray Eels. Just up the ledge is one of the largest most pristine brain corals we have ever seen! You'll want your camera! The Wreck of the DuaneThis is a deep shipwreck for advanced trained divers. This is a must-see world-class diving experience just 25 minutes from our dock. She was intentionally sunk on 11/26/87 after her decommissioning on 8/1/85. The Duane is 327 feet long with a 41-foot beam. Her bow faces southwest while sitting in 120' just minutes to the south of Molasses Reef. She sits upright and is fully in tact, completely encrusted with soft corals of all shapes, sizes and colors! The main deck is at 105' and the smoke stack sits at about 70'. All the big critters call this home, so be prepared to swim through the hundreds of large curious barracudas, or watch the permits tightly schooling around the wreck! Be prepared for strong currents and don't forget your dive gloves! History of the Duane (WHEC 33) The United States Coast Guard Cutter Duane, named after William J. Duane, secretary of the Treasury under President Andrew Jackson, is also one of seven 327 foot Secretary class vessels. Designed for the same reason as the Bibb, she was built at the U.S. Navy Yard, Philadelphia, Pennsylvania, launched on June 3,1936, and placed in commission on August 1,1936. At her first home port of Oakland, California, Duane's assigned duties included search and rescue and law enforcement. In 1939, she was moved to the East Coast and operated jointly with the Navy as part of a destroyer squadron to assist shipping in the North Atlantic. In 1940, when the Atlantic Weather Observation Service was established Duane was detailed to patrol the first weather observing station in the North Atlantic. On June 14, 1941 the Duane rescued 46 survivors from the British Merchant Ship Tresillian sunk by the German U-Boat U-175 On April 17,1943, Duane and sister ship Spencer sank the German U-Boat U-77. The Duane rescued 22 crew members from the Nazi vessel. Late in 1943 she shifted operations to the Mediterranean and then served in 1944 to the flagship of the amphibious force invasion of Southern France. In 1946 she was reconverted and put back into peacetime service fulfilling roles in Search and Rescue, Ocean Station Patrol and Fisheries patrol. On May 19,1957, Duane rescued 28 from the Finnish freighter Bornholm, between the Azores and Bermuda. Between July 1957, and July, 1968, Duane served in Vietnam as part of the Coastal Surveillance Force. In the 1970's, Duane was involved in drug enforcement and routine patrol. In 1972, her home port was changed from Boston to Portland, Maine. In 1980 she was one of several Coast Guard Cutters involved in shepherd mg boats during the "Mariel Boat Lift" off the Island of Cuba to Key West. On August 1,1985 she was decommissioned as the oldest active U.S. military vessel. She was sunk November 26, 1967 in approximately 120 feet of water. She rests in an upright position about a quarter mile from her sister ship, the Bibb. 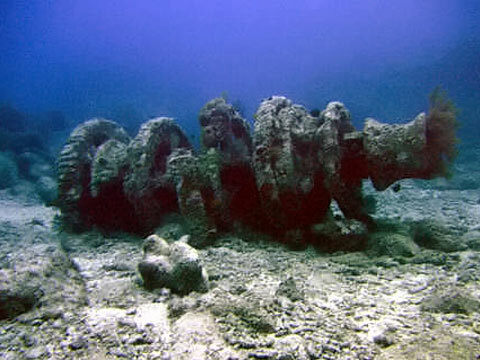 Hide Duane History USS Spiegel GroveThis is another deep shipwreck for advanced trained divers. The Spiegel Grove was commissioned as a Landing Ship Dock on 6/8/1956, and decommissioned 10/2/1989. Her beam is 84 feet wide, and she is a four-story building of sheer metal, comprised of gun turrets, the wheel house, cranes, and much more! It is a 55-130-foot wall dive that stretches 510 feet longâ€¦so don't even think you will see the whole ship in one or two dives!! And by the way, dive computers are mandatory for this dive!